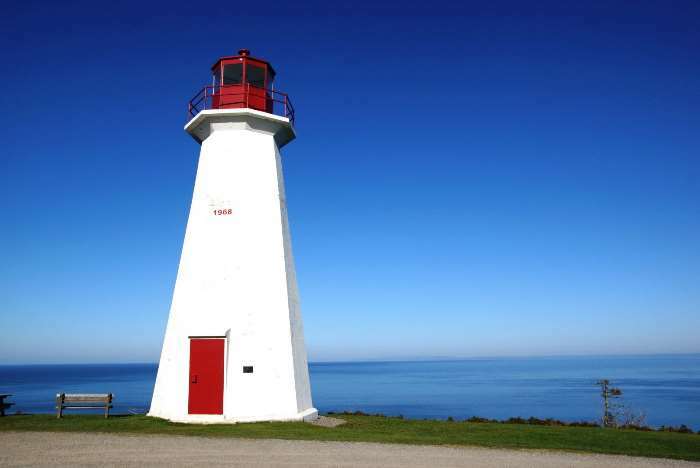 Lovers of lighthouses will have no shortage of destinations in Nova Scotia. If you happen to be looking for one near Antigonish, I’d suggest taking the scenic drive north to Cape George, where a traditional red-and-white lighthouse stands high above the Northumberland Strait, just waiting to be photographed. From Trans Canada Highway 104 at Antigonish, head north on either Route 245 (the inland route) or Route 337 (the coastal route). Either way you go, you’re headed for the northernmost tip of this peninsula. When you locate Lighthouse Road (slightly south and east of the north tip), do NOT turn into the parking lot. Keep driving to the end of the road, and you’ll see the lighthouse. It’s a nice, relaxing drive up the coast from Antigonish to Cape George — unless of course, you’re trying to squeeze too much into the end of your vacation. And by you, I mean me. I really should have driven on to my motel in Moncton, New Brunswick, and called it a day, but this peninsula, and the curvy road following the coast, looked too tempting. Plus, there was another lighthouse waiting to be appreciated. Going to see it was the least I could do. 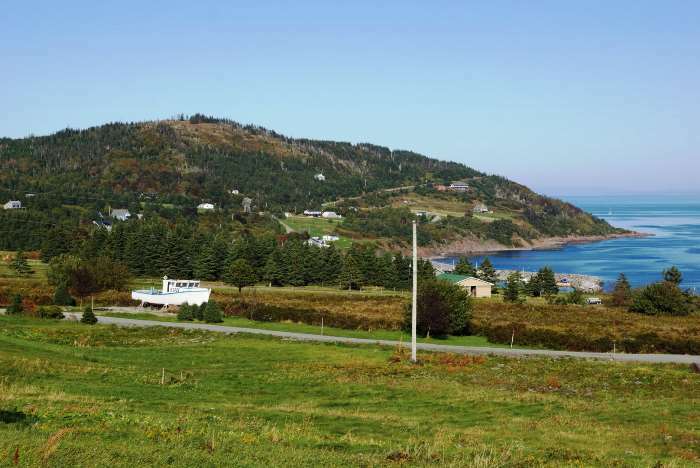 … is at Ballantyne’s Cove, just a bit south of the northernmost tip of the peninsula. There’s a turnout here, where you can look ahead at where you’re headed. Keep driving on 337 through the small community, watching for Lighthouse Road on the right. When you make the turn, you’ll almost immediately see a driveway into a parking area for a picnic spot. I figured this was the parking lot for the yet-unseen lighthouse. 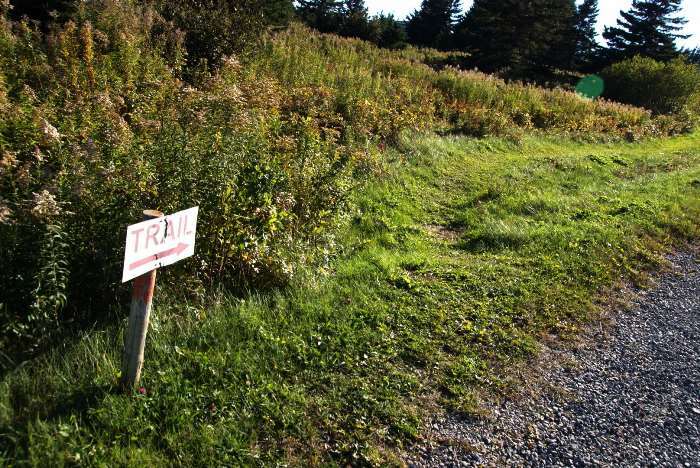 A sign that said “Trail” further confused the matter. I hiked down this trail for a few minutes, even though it seemed like I was going the wrong way. And I was. I gave up and returned to the car. On the way, I saw someone, and asked. They told me that I should just drive up to the lighthouse, like I was an idiot. Okay, fine. Maybe I am. … the Cape George Lighthouse. You can basically drive right up to it, no hiking trail required. There are picnic tables here, too (which begs the question why anyone would want to picnic at a picnic area that’s noticeably lacking a lighthouse, when one is available just a short distance away). This is the third lighthouse to stand on this property — and as lighthouses go, this one is pretty new. It was built in 1968 in the traditional octagonal style. The original lighthouse was placed here in 1861, the second in 1908. From the top of this bluff, you’ll have an excellent panoramic view of a whole lot of water. This is St. George’s Bay, an offshoot from the larger Northumberland Strait — the water that separates Nova Scotia from Prince Edward Island. Look to the left across the strait and you may be able to see PEI, and to the right across the bay, you might catch a glimpse of Cape Breton Island. I met a local guy here who was mowing the grass and tending to some landscaping maintenance around the lighthouse — not so shockingly, another friendly Nova Scotian who wanted to chat. He pointed out the flock of birds hovering over the water in a certain spot. 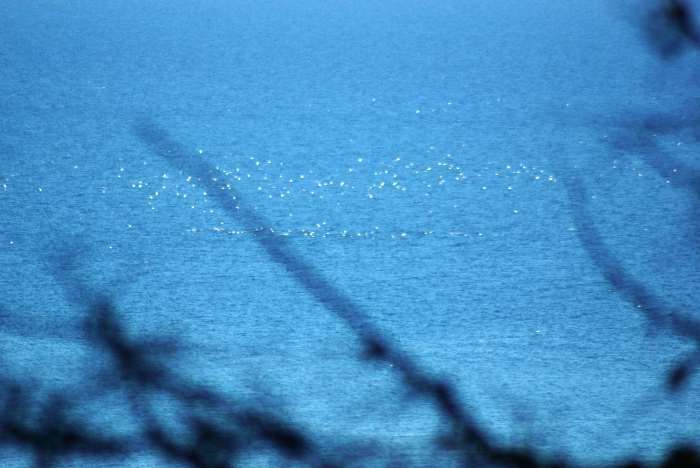 The birds suggested a school of fish was in the water below, which suggested a whale sighting might follow. Unfortunately, I never caught a glimpse of a breach, but they were probably out there, somewhere. At this point of the late afternoon, I still had about another 300 kilometers to drive, before I was done for the day, so I had to skip a lot of the nice scenery along the way back down to the TCH. I followed Route 337 to Route 245, which continues down the coast to New Glasgow. There is another lighthouse along the way, the Arisaig Light, but unfortunately I decided to skip it. You can, however, see much more of this route in the Drivelapse videos below. I wish I could have devoted more time to the scenic drive out to Cape George. I really should have taken the time to go out to see Arisaig Lighthouse. While Cape George Lighthouse was scenic and photogenic, there really wasn’t much to do there, other than take a few pictures.